Though Dan Dare nowadays is somewhat overlooked, it is still without doubt one of the most influential pieces of British Science Fiction ever made. In many ways Dan Dare for me is like the British version of the The Twilight Zone in that its one of these things that is such a well of ideas, virtually every science fiction series that has come after it owes a little to it either directly or indirectly. Sadly however because Dan Dare has bizzarely never really had a long life outside of the comic book medium then I think it tends to get overlooked in comparison to other prominent works. In this article I will explore what it is exactly that the worlds longest running science fiction series owes the Pilot of the Future’s exploits as well as the relationship between both franchises. Now for those of you who may be unfamiliar with it, Dan Dare was a British comic book series created by Frank Hampson that ran initially in The Eagle weekly comic strip during the 1950’s and 60’s. It obviously centered around the character of Dan Dare, who was a fine, upstanding, square jawed space pilot in the futuristic “1990’s”. The series tried despite its larger than life concepts to be as scientifically accurate as it possibly could, with acclaimed science fiction author, Arthur C Clark, then at the beginning of his career serving as the strips scientific and story advisor. The series however still looks somewhat scientifically dated by todays standards as most of its strips which were set within our solar system involved life on planets such as Venus and Mars, which subsequent space probes have shown to be lifeless. Dan Dare was hugely popular in its native United Kingdom, with sales of the strip at one point reaching as high a figure as 3 million. 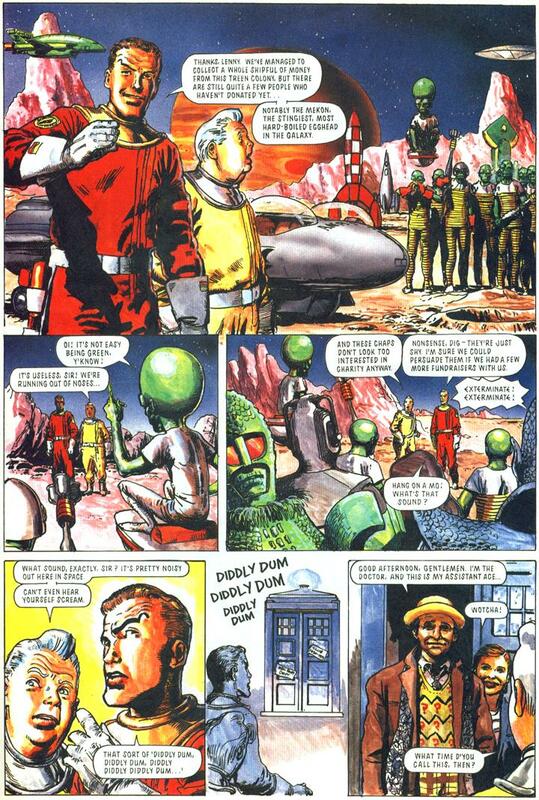 Dan Dare would prove very influential on Doctor Who in quite a number of ways. The most obvious example of the strips influence on Doctor Who is the way that Dan Dare’s archenemy the Mekon inspired Davros. The Mekon was a scientific genius who ruled over the cold and logical Treens of Venus. He sought dominion over the entire universe and relied solely on his scientific intellect to battle Dare. The Mekon’s body was atrophied and weak so therefore he flew around on a levitating chair. The Mekon was an immensely popular character. In some ways even more than Dare himself! 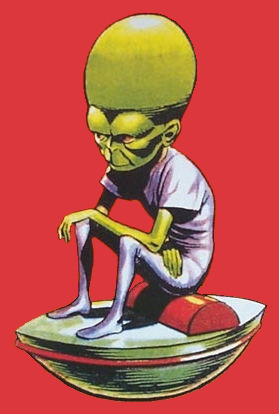 It was the Mekon for instance rather than Dare who made Empires list of 50 greatest comic book characters. Now both Philip Hinchliffe and Terry Nation were huge Dan Dare fans, and they based Davros on the Mekon in terms of his character, leader of a group of ruthless would be universal conquerers and his appearance too. One only has to look at Davros to see how much he resembles the Mekon. Philip Hinchcliff admits to having taken inspiration from the Mekon for Davros on the DVD of Genesis of the Daleks. The Treens meanwhile were not only an inspiration on the Daleks, but also on the Cybermen and the Sontarans too. 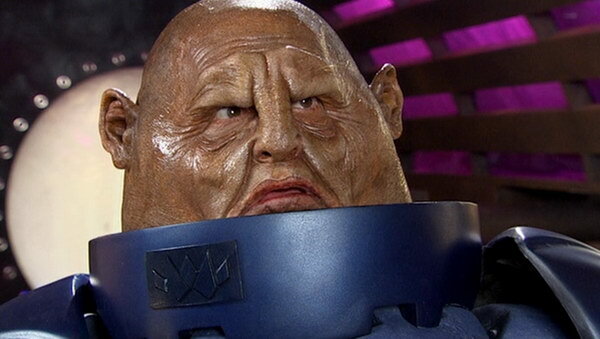 The Sontarans as you can see bare a a rather strong resembelance to the Treens in both looks and personality too as the Treens whilst logical do enjoy war and glory in crushing lesser races. One Treen however ends up becoming an ally of Dare’s much like Strax and the 11th Doctor. This Treen is even named Sondar! The Cybermen’s cold and logical nature meanwhile was lifted somewhat from the Treens too. Kit Pedler co-creator of the Cybermen has cited the Treens as one of his biggest influences in creating the Cybermen. Kit Pedler would even supply an introduction to a reprint of Dan Dare in 1979 “The Man From Nowhere” where he even stated that “the Cybermen are very like the Treens” whilst talking about how Dan Dare influenced his career as a writer overall. In addition to this the first Cyberman story which Pedler co-wrote borrows directly from a number of Dare stories not only through the parallels between the Cybermen and the Treens, but also in the idea of a planet returning to our solar system as well. In “The Tenth Planet” Mondas Earth’s identical twin planet returns to our solar system after a long absence and attacks the earth. In three Dan Dare stories planets venture into our solar system, and in two of them they attack the Earth just like Mondas. However no writer on Doctor Who borrowed more from Dan Dare than Terry Nation. The Treens much like the Daleks were portrayed as xenophobic, despising other life forms for being different to them. The Treens were even used as a metaphor for the Nazis too just like the Daleks were. Frank Hampson said “Basically we were fighting the Second World War again the Treens were the Nazis”. Furthermore take a look at the first ever Dan Dare strip and you can see it has a very similar story to the original Dalek story. In “The Pilot of the Future” all of earths attempts to reach Venus have been blocked by a unknown force. Dare finally manages to find a way to land onto the planet, and soon explores a futuristic city and is captured by its inhabitants the evil, xenophobic and logical Treens. Dare escapes and contacts the blonde pacifists the Therons who ages ago had fought a centuries long conflict with the Treens and now forsake violence. Dare is able to convince the Therons to abandon their pacifistic ways and help him and a group of earth men defeat the evil Treens and safe the earth from them as well as capture their city. The first Dalek story similarly sees the Doctor, Ian, Susan and Barbara land on the planet Skaro where they discover a futuristic city and explore it. They are soon taken hostage by the Daleks. Cold, logical, and xenophobic creatures. They manage to escape however and work alongside the blonde pacifists The Thals who faced the Daleks eons ago and now forsake violence. The Doctor is able to convince the Thals to abandon their pacifistic ways and help them capture the Daleks city. “The Reign of the Robots” sees Dan and his team return to London after ten years away in space. The capital is completely deserted and they visit several landmarks and discover that the Treens in their absence have invaded and conquered the earth. The Treens have also created robot servants to help them rule mankind. The Treens also set up a huge mining operation in England too. Ultimately Dare and his team are able to defeat the Treens by taking control of a microphone in their base which they use to control their robotic servants, giving them new orders to turn on the Treens. 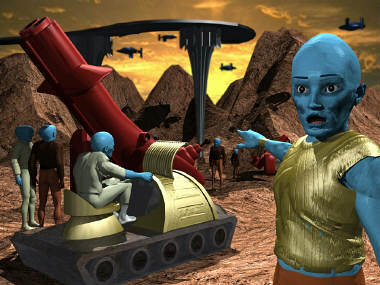 The invasion is thus repelled and the Mekon is defeated and his spaceship destroyed. In “The Dalek Invasion of Earth” the Doctor, Ian, Barbara and Susan arrive on earth after a long time away in London. They discover it is completely deserted and and pass by familiar landmarks only to discover that the Daleks have invaded the earth. The Daleks have created robot servants “Robomen” whom they use to help them rule. The Daleks have also set up a giant mine in England too. Ultimately the Doctor and friends are able to defeat the Daleks by taking control of a microphone that they use to control the Robomen and give them new orders to turn on the Daleks, which leads to the end of the Invasion. Nation would again take inspiration for “The Dalek Book” the first ever piece of Doctor Who merchandise which featured the character of Jeff Stone who based very heavily on the character of Dan Dare himself. Both Marc Cory and Brett Vyon were also very heavily inspired by the character of Dan Dare. Finally “The Dalek Chronicles” which were actually written by David Whitaker featured the humanoids that the Daleks had been before they mutated into their current form. 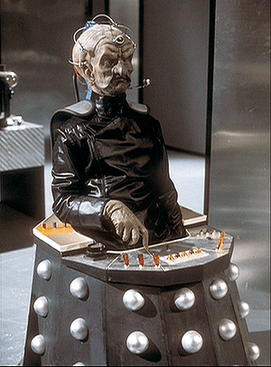 These humanoid Daleks much like Davros also greatly resembled the Mekon. Finally the Dalek Emperor from “The Dalek Chronicles” also resembles the Mekon too. Not in appearance but character with David Whitaker mentioning that he based him largely on the Mekon. The emperor was even given a similar larger head to demonstrate his intelligence just like the Mekon. Don’t think this means that I believe that Terry Nation was a hack or ripped off other people’s work or for that matter that any of the other authors of Doctor Who who borrowed from Dan Dare such as Kit Pedler were guilty of plagarism. Nothing is original and it doesn’t matter how much you take from another source as long as you do something new with it, which obviously the Daleks, the Cybermen and the Sontarans all were. However I still find it interesting to see how the Treens were essentially the forbears to many of Doctor Who’s greatest enemies. The Daleks xenophobic nature, the Cyberman’s cold and logical personalities, the Sontarans passion for war all stem from the Treens. In many ways however the Treens can be seen as the forebears in general to alien species in science fiction who are more of an organized society than just space monsters. The Martians in “War of the Worlds” for instance are just alien monsters . We don’t see their whole society, we know nothing about them other than they are evil octopus creatures. With the Treens however we saw their city, knew about their history and how they react to ordinary every day things albeit in obviously different way’s. Thus it was really in this way more than any other that I would say the Treens were influential on Doctor Who’s alien races, who would in turn go on to inspire other alien creatures in much the same way. Other examples of Dare’s influence on Who include “The Big City Caper” about an alien menace that uses the Post Office Tower as a base of operations to conquer the world. This premise turns up in the first Doctor story “The War Machines”. Another Dan Dare strip features a Web trapping a spaceship whilst its in space, which is similar to the Web of Fear when the TARDIS is trapped in space by the Great Intelligence using a web. “The Earth Stealers” also features a corrupt organisation “Earth Redistribution Limited” moving mankind to Mars to exploit them, which is a similar premise to “The Sun Makers”. Thus I think its fair to say that Dan Dare overall had quite a visible influence on Who throughout the years. Many pieces of spin off Doctor Who material have referred to Dan Dare as a fictional character in the Whoniverse. Still despite this a crossover strip between the two series was produced for Comic Relief in 1991. Here Dare met at that point all 7 incarnations of the Time Lord, as well as Ice Warriors and Cybermen. Sadly they could not get the rights for the Daleks to appear, though something is heard to chant Exterminate from off screen. Obviously this strip is not canon to the main Whoniverse and it is played for laughs. It would be difficult for Dan Dare to take place in the Whoniverse as we would have to know about aliens during the 90’s, which the revival contradicts by showing us people in the 21st century who are unaware of alien life. Also there was no invasion and conquest of the earth by Treens in the mid 00’s which according to Dan Dare canon there would have to be, and I think it can be agreed that the Doctor has enough conquering, alien invaders to deal with without adding the Treens to the mix.